As I surfaced consciousness, not entirely sure of where I was in the dense darkness of the forested campground, I pulled out my ear plugs (an essential defence against Scott’s snoring) and was immediately assaulted with an almighty cacophony of shouts, screams, singing and laughter. ‘It’s those kids’ I mumbled. I yawned widely. ‘The ones in the group campsite, they arrived this afternoon, I mean yesterday’. It was already after midnight. Apparently Scott hadn’t noticed the group after we rode back into the campground after a full day of mountain biking; perplexed by both the level of noise and my unconscious state (I normally wake at the slightest sound) he momentarily wondered if there was some kind of crisis unfolding. That’s probably another reason I love outdoor sports so much, the combination of fresh air and exercise conks me out at night. 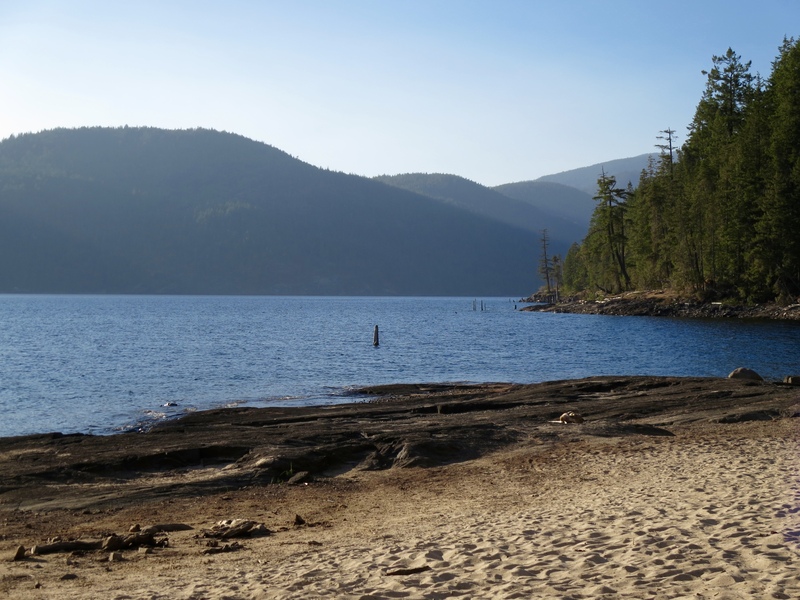 For three nights at Haywire Regional campground, tucked way behind Powell River down a forestry road and edged by the refreshing water of Powell Lake, it had been stunningly quiet at night – apart from the whisper of a breeze in the evenings rustling the branches of trees circling each site. But now we were into the weekend and slightly different, unwritten rules applied. Popular with the locals, this was the campground to come to for a family and friends get together. Lots of drinking, music and letting off steam. Nothing got too out of hand though, good-natured (if noisy) fun seemed to predominate. Just go during the week if you want to avoid the party atmosphere, or to the quieter, nearby Inland Lake Provincial campground. 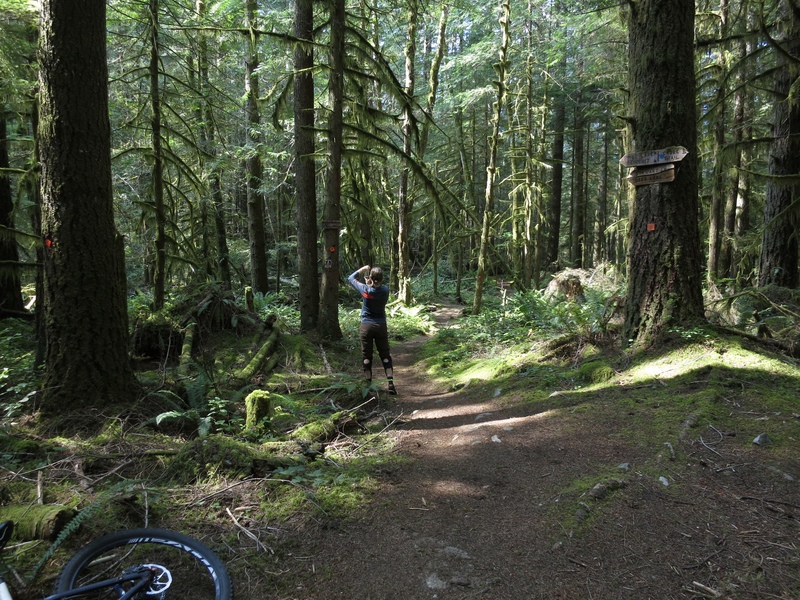 Powell River on the Sunshine Coast was the third and final new area of mountain biking for us last summer. 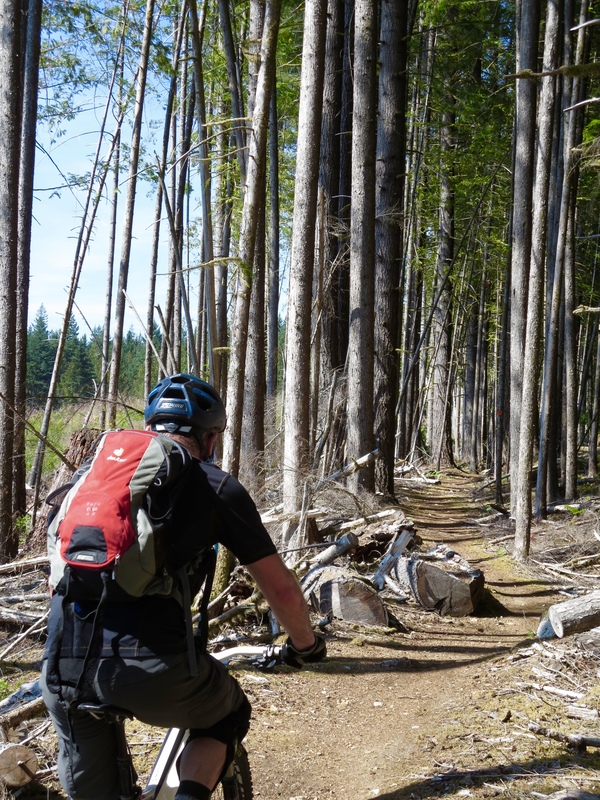 Now a historic and cultural site – the city sits on the traditional territory of the Tla’ Amin Nation and the pulp and paper mill was once the largest in the world – the area is increasingly a playground for outdoor enthusiasts; some of the trails we were riding around the Duck Lake area had been custom-built for the BC Bike Race. 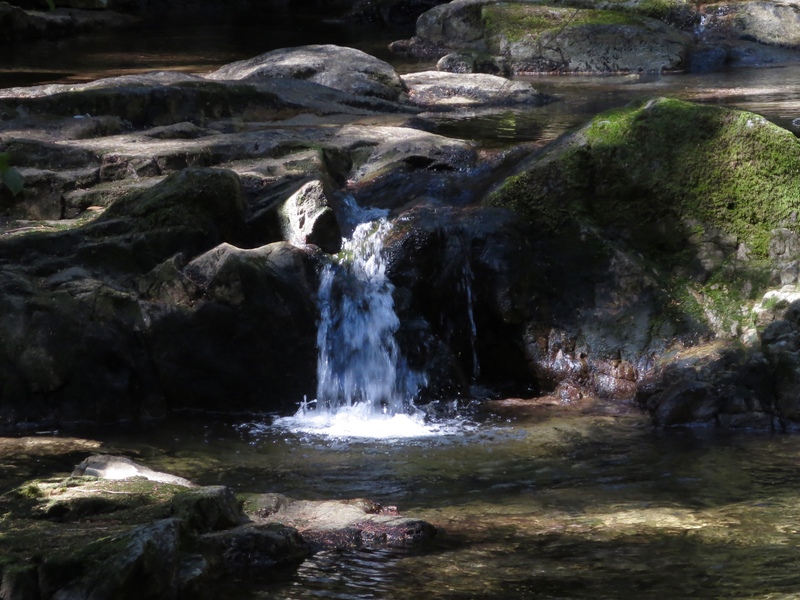 We already felt spoilt with our trips to Quadra Island and Cumberland and weren’t necessarily planning another break, but I shifted things around a bit at work and we headed out for a few days mid August. Not the smartest move; a hot and busy time of year and I hadn’t made any campsite reservations. Not sure what we were thinking really, it was very much a ‘go and see how it works out’ situation, if we had to we’d just come home. In a way, it was a choice made out of desperation; as the smoke from wildfires rolled in yet again, I obsessively looked up the air quality index to see where we might escape to and Powell River on the Sunshine Coast popped up. Two ferry rides away and some driving to be sure, but not that great a distance from Vancouver. Surely they’d have smoke too? And by the end of our visit they did, but not before we got in some gorgeous cross-country riding for five or so days. We had no problem bagging a camping spot either. Lucky. 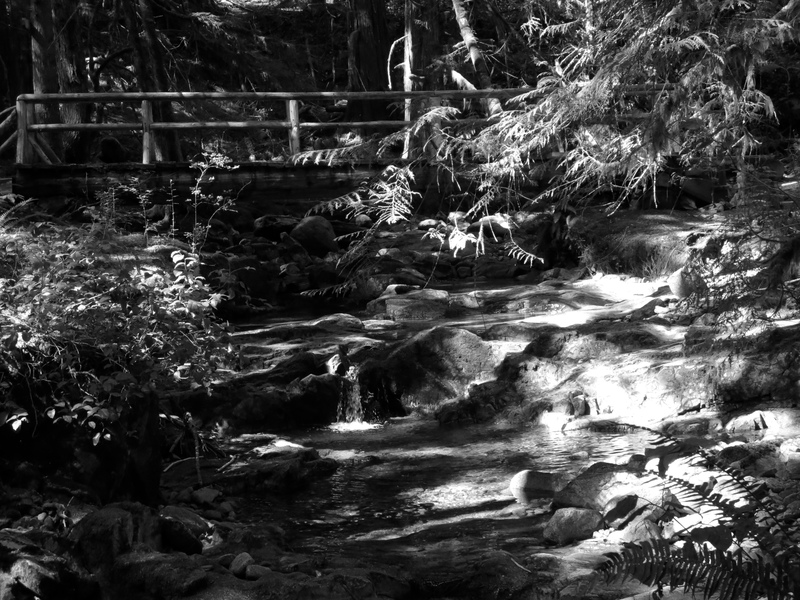 And it was gorgeous; long, winding trails snaking through forest – aromatic with the scent of fir and pine. 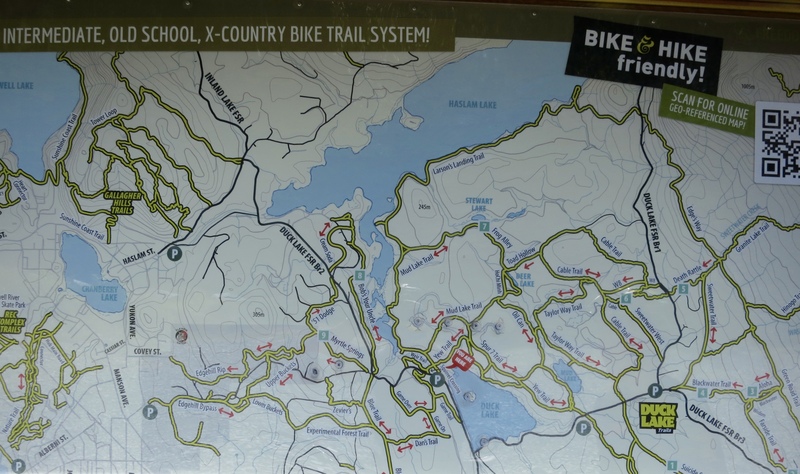 Sporadically the trails flirted here and there with the shores of Mud, Stewart, Haslam or Duck Lake. Every route seemed brilliantly maintained, obviously ridden a lot, but we barely saw a soul. Each day we barrelled down gravelled roads towards Duck Lake, parked and picked our route. It was hot, but the forest protected us. We rode for hours, exploring the myriad byways. When we started to overheat, we sloshed water over our heads from streams and sat in the shade, guzzling the copious amounts of water we’d brought with us. And in the evenings back at the campground we threw ourselves into Powell Lake. A forested path close to the tent led us out to a smaller, less busy beach. Around dinner time it was often deserted and we lingered as the sun slid away, picking our way back by torchlight to our campsite for a glass of wine and hastily thrown together meal. How does it go? Eat, sleep, ride, repeat? Check.